The Volkswagen B6 Passat debuted at the Geneva Motor Show in March 2005, and launched in Europe in the summer of 2005. The B6 Passat no longer shared its platform with Audi's equivalent model (the Audi A4), and is instead based on a long-wheelbase version of the platform used by the fifth-generation Golf (called Rabbit in the United States & Canada), and its sedan equivalent, the fifth-generation Volkswagen Jetta, and therefore seeing a return to a transverse engine compared to the longitundinal layout of its predecessor. 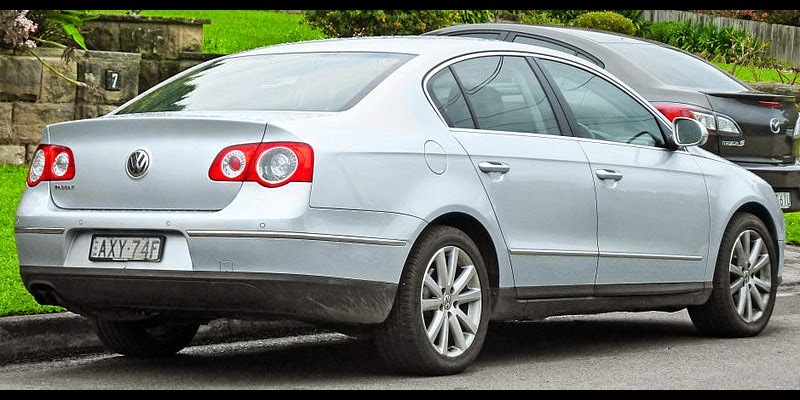 Confusingly, although this model is referred to as the "B6" (or "Typ 3C") Passat it has minimal commonality with the "B6" (Typ 8E) Audi A4, which was based on its own unique platform when it was launched in 2001. On the four-wheel drive version, called 4motion, the transverse-engine platform dictated a switch from the Torsen centre differential of the B5, to the Haldex Traction multi-plate clutch. The change to the Haldex system also changes the handling closer to a front-wheel drive car, with better fuel economy claimed. Compared to the Torsen, the Haldex can direct torque more unequally to the front wheels (from 100:0 to 50:50 front-to-rear bias), thus providing a wider bias range than the 75:25 to 25:75 of the B5 Passat. Haldex is a reactive-type system, behaving as a front-wheel-drive vehicle until slippage is detected, at which point up to a maximum of 50% of the torque can be transmitted to the rear axle. See the Audi-related quattro (four wheel drive system) article for more information. Fuel Stratified Injection is used in nearly every petrol engined version of the Passat, ranging from 1.6 to 3.6 litres (the 1.6 litre DOHC can reach 100 km/h (62.1 mph) in 11.5 seconds, and 200 km/h (124.3 mph) for manual transmission versions), but the multi-valve 2.0 litre Turbocharged Direct Injection (TDI) I4 diesel is the most sought after version in Europe (available in both 140 PS (103 kW; 138 hp) and 170 PS (125 kW; 168 hp) variants). In the U.S. market, a 200 PS (147 kW; 197 hp) 2.0 litre turbocharged I4 is the base engine, or a 280 PS (206 kW; 276 hp) 3.6 litre VR6 engine as the upgrade, with six-speed manual (only available on the base 2.0 T model) and automatic transmissions. 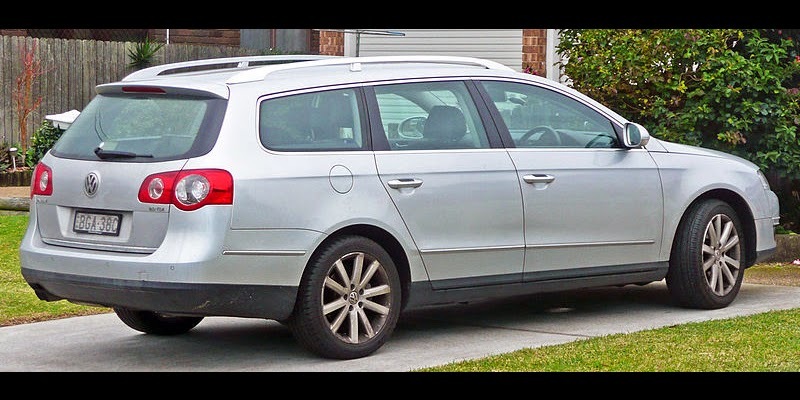 As of the 2009 model year, the VR6 engine and 4motion option were no longer available in the US on the Passat sedan and wagon, but are available on the Passat CC. In China, the PQ46 Passat was released by FAW-Volkswagen (FAW-VWVolkswagen Group China subsidiary FAW-Volkswagen (FAW-VW) as the Magotan, after Volkswagen's other joint venture in China, Shanghai Volkswagen Automotive (SVW) had decided to continue using the B5 platform for the Passat and the Passat Lingyu (long-wheelbase Passat). 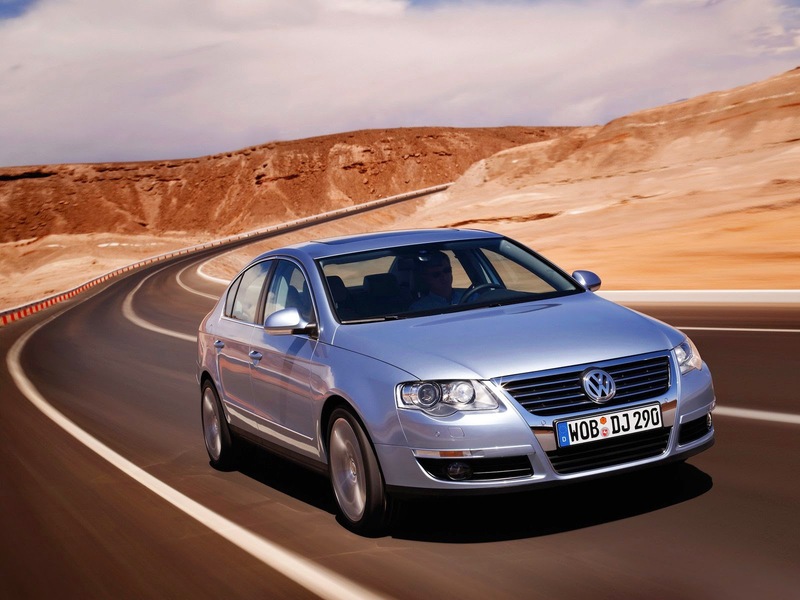 Since August 2010 the wagon version of Passat B6 will be offered in China, which is a fully imported model. But this car is simply called Volkswagen Variant in China, in order not to refer the name "Passat" or "Magotan". It is a concept vehicle capable of using natural gas or conventional petrol fuel. It includes a 1.4-litre TSI 150 PS engine featuring both a supercharger and a turbocharger operating sequentially, 22 kg capacity natural gas tank mounted beneath the boot floor and 31-litre petrol tank. Production version went on sale at the end of 2008 in mainland Europe, for saloon and estate versions of the Passat. At the Frankfurt Motor Show in September 2007, Volkswagen launched the 'R line' R36, created by Volkswagen Individual GmbH. The R36 uses a 3.6 litre VR6 engine rated 300 PS (221 kW; 296 bhp) and 350 Nm (258 lbft) of torque, which pushes the saloon and Variant (estate/wagon) to 100 km/h (62.1 mph) in 5.6 and 5.8 seconds respectively. The name "R36" is derived from the engine displacement, 3.6-litres. The R36 has many distinguishing features over the other Passat siblings, such as a redesigned front and rear spoilers, 18" Omanyt aluminium alloy wheels, 20 mm (0.8 in) lower suspension, 'R' engraved stainless steel pedals, 'R' imprinted sport leather seats, Bi-Xenon headlights, and twin rear muffler tailpipes. 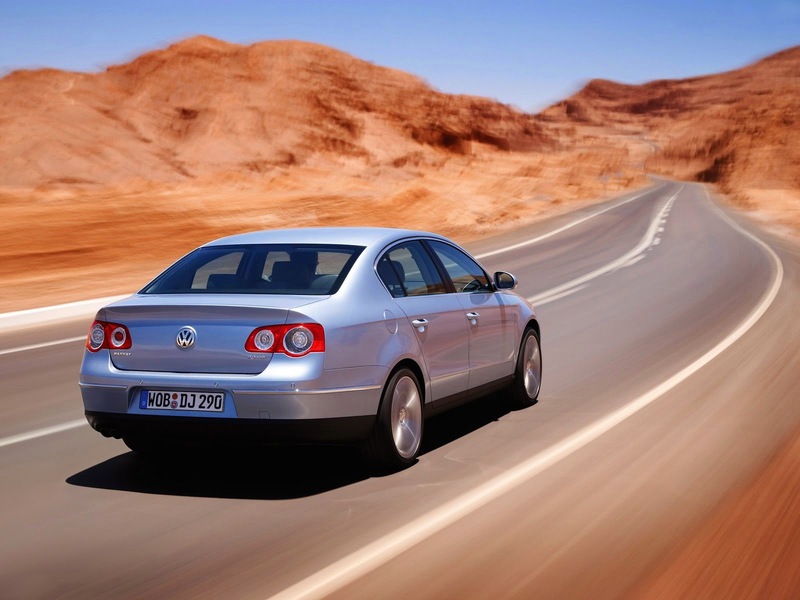 In July 2008, Volkswagen launched the R36 version in the Middle East. The CC ("Comfort Coupé") is a 4-door "coupé" version of the Passat. It debuted at the 2008 North American International Auto Show in Detroit. Originally aimed at competing with the similarly styled Mercedes CLS, the Passat CC intends to be more stylish and luxurious than the previously released Passat B6. In the U.S., the name "Passat" was dropped, and the car is being sold as "CC". Some options specific to the CC include hands-free parking, lane-departure prevention, intelligent cruise control, and adaptive suspension. Engines offered in the CC mirror those of the regular Passat, with options of the base 2.0 liter turbocharged four-cylinder, or the optional 3.6 liter V-6, which includes 4-motion all wheel drive. 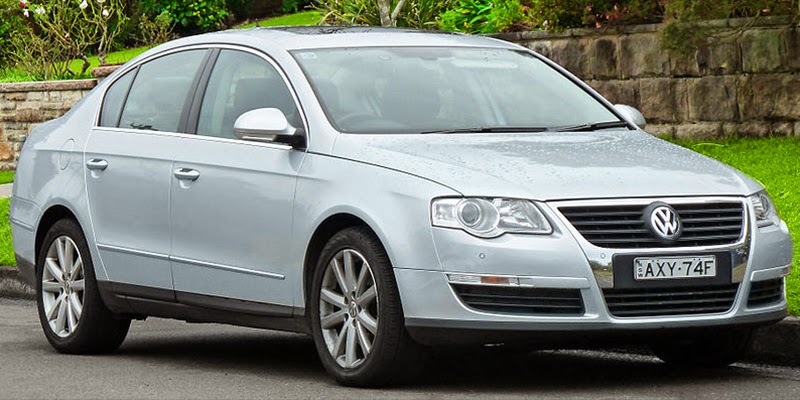 Although the CC is marketed as a more luxurious Passat B6, it comes in with a lower price tag. While the MSRP of a Passat B6 is $29,300, the CC comes with a base price of $27,100. As in North America, the Passat CC will from the 2012 facelift drop the Passat name in Europe and be called Volkswagen CC. The B6 Passat was facelifted by Klaus Bischoff and Walter de Silva, and was unveiled at the Paris Motor Show in September 2010. Although designated "B7", the car is not an all-new model. The facelift resulted in new external body panels except for the roof and glasshouse, with the prominent changes to the grille and headlights. Overall height and width dimensions are unchanged from the B6 Passat, while length increases by 4 mm. New features include a fatigue detection system and an automatic "city emergency braking" system. It arrived at dealerships in December 2010. In Malaysia, DRB-HICOM debut the locally-assembled Passat B7 with much similar to the European. The Malaysian model does not have sunroof and auto-folding wing mirror which was came as standard in the imported blend. No other engine variance was available than the 1.8T but pricing had been significantly reduced by 10% than the imported ones. In October 2010 Volkswagen presented at the 2010 Tokyo Motor Show the Passat Alltrack. The Passat Alltrack bridges the gap between the passenger VW range and the SUV range comprising the Tiguan and Touareg. AXX / BWA / BPY? In February 2008, the 2.0 FSI was replaced with the new Audi-developed 1.8 TSI engine and 6-speed automatic transmission. The 1.8 TSI is rated at 160 PS (118 kW; 158 hp), 250 Nm (184 lbft) and reaches 0–100 km/h in 8.6 seconds, reaching a top speed of 220 kilometres per hour (136.7 mph). This engine is part of the wider Volkswagen Group policy for engine sharing. 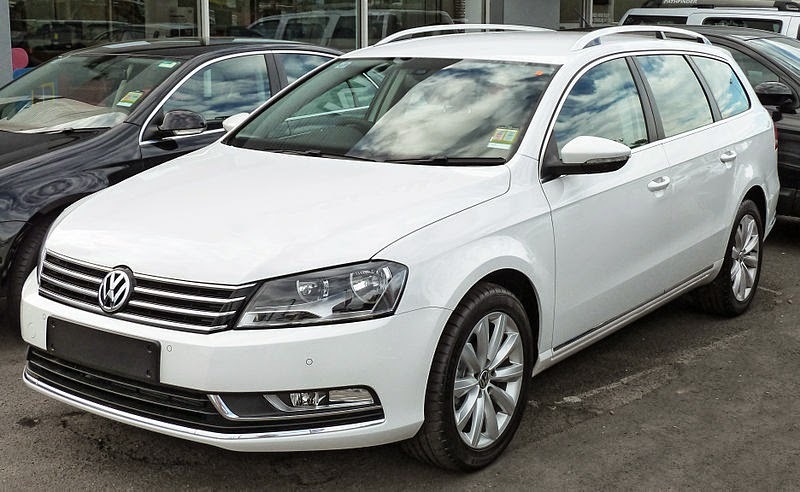 The Passat B7 range features several petrol and diesel engines, all to Euro 5 standards. All diesel engines feature BlueMotion Technology and Diesel Particulate Filter as standard. The BlueTDI engine is fitted with a Selective Catalytic Reduction system which makes it ready for Euro 6 standards. On December 21, 2010 an agreement to assemble Volkswagen vehicles in Malaysia was signed between DRB-Hicom and Volkswagen AG, which followed the MOU signed by both parties in August of that year aimed at investigating the possibility of local vehicle production. The first locally-assembled VW model to be rolled out from DRB-Hicom's Pekan plant in Pahang state, Malaysia, was the Volkswagen Passat in 2012. Last updated on 26 September 2014 at 07:16.